A tribute to young mothers! Oh no … The woman with the young baby is sitting next to me on the plane!! My early prayers were that the weirdo in the queue who was intoxicated wouldn’t be next to me …can I take him instead? I’ve dodged the ‘baby on the plane‘ bullet for long enough and this time it happened and this kid is a live wire. Within the first 30 seconds I am slapped by the little live wire as she jumps and hops and kicks and can’t stay still. Deirdre gives me some early advice “avoid eye contact with the kid“. She always has something wise to say – I decide to take the advice. 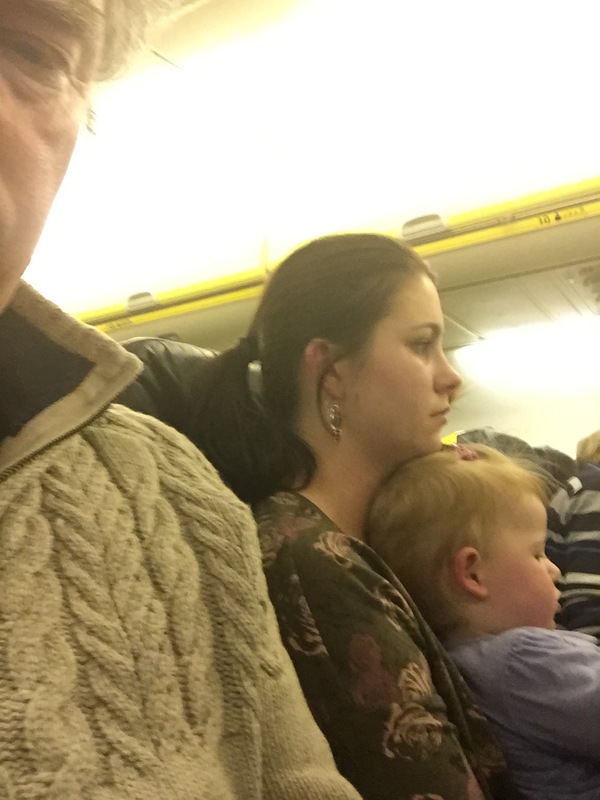 The young mother who seems to be travelling alone is well equipped – her bags with all her necessary baby stuff are put down by her feet, which in a blink chews up all of the leg room in the already squashed Ryanair flight. To calm the kid down she produces a bottle … That works for about 5 minutes, an IPad works for another 5 minutes and then we enter the ‘danger zone’. The kid is now standing, twisting, jumping and writhing and starting to make noise as she reaches for anything and anyone that grabs her attention. I can barely move in my seat but the very talented mother can still manage to get things from her bag and put things away and still keep the contorting baby on her lap. My god…. this is unbelievable… why would she even contemplate such a journey and the little part I’m witnessing no doubt came after struggling with luggage and buggies..why ? Oh no ..Now comes the sniffing of the bum … please let it be a clean one for everyone’s sake – I was looking forward to a glass of wine and now I’m just praying for no smelly surprises!! More writhing and wriggling … What happened – we have calm. The drinks trolley arrives and the poor mother watches enviously as we order a red wine and a prosecco – I feel very guilty and want to ask her does she want a drink … she would probably think that I am a weirdo! Is she dreaming of a time when life was less complicated? Where is she flying to? Why is she by herself? We are flying to Wroklaw (up until a month ago I hadn’t heard of it either!) in Poland with friends for the weekend. My guess is she is living in Ireland and visiting home for a while ..maybe? The kid is acting up again so she is down by my feet scrambling in her bags for the next rabbit … Baby’s bottle! It’s all calm again. I spoke too soon … the bottle goes flying and hits me on the leg. At this stage I have my red wine firmly gripped to make sure it doesn’t go flying as well. I don’t think you should be giving her a banana …I’m now fearing the worst …smelly bum, pukes and tears. You won’t believe this … I manage to knock over my own red wine on my one pair of jeans …typical !! Sh**, f***, pi**. My young mother politely reaches into her bag of tricks and comes to my rescue with baby wipes!! As the plane descends the poor kid starts to cry with the air pressure and her mother holds her and strokes her head until the plane lands..phew! As I come down the steps of the plane I see this miracle mother struggling with her bags, her buggy and her child before the next leg of her journey. Mother , I salute you for the fantastic job you do !! This entry was posted on December 10, 2014 at 3:01 pm and is filed under Air travel, Family, Holidays, Parenting, Travel. You can follow any responses to this entry through the RSS 2.0 feed. You can leave a response, or trackback from your own site. p.s. I hope you got the red wine stain out! Thanks for reading !! I think the stain came out ..